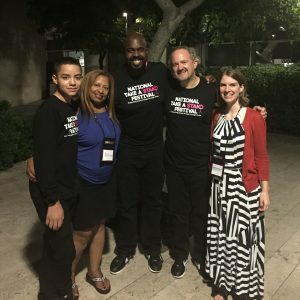 Hector Otero, a student of Wharton Institute for the Performing Arts’ Paterson Music Project (PMP), returned recently from a cross country trip to Los Angeles to participate in the National Take A Stand Festival! 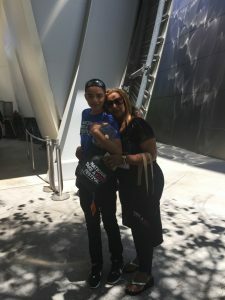 Hector had the opportunity to make new friends from other El Sistema-inspired programs nationwide, develop his musical skills, and perform at the Walt Disney Concert Hall. Hector says that he will bring his newly acquired skills and knowledge back to Paterson with him this fall as he enters eighth grade at the Community Charter School of Paterson. Hector had the honor of being accepted into the National Take a Stand Festival Junior String Ensemble, an opportunity specifically for younger musicians and open to only 36 string players aged 12-15 from across the country. Se lecte students worked with a world-class artist faculty and rehearsed and performed at Walt Disney Concert Hall in Los Angeles. As an ambassador for PMP and his community, Hector traveled to Los Angeles and Aliso Viejo, CA from July 5-15 to participate in the event sponsored by the Los Angeles Philharmonic. Hector with his mother, Mary Luz, in Los Angeles. Hector with his mother Mary Luz, cellist Terrence Thornhill, Maestro Jeffrey Grogan, and PMP Program Director Elizabeth Moulthrop. Two familiar faces greeted Hector in Los Angeles: Oklahaom City University Director of Orchestras, Jeffrey Grogan, founder and former Artistic Director of PMP, led the Junior Strings Ensemble in Sibelius Andante Festivo and Soon Hee Newbold Perseus at Disney Hall. Hector had the rare opportunity to meet and work with Soon Hee Newbold, renowned composer and arranger. PMP Founding Teaching Artist, Terrence Thornhill, participated as a cello coach, working with the Junior Strings Ensemble and cello section for the 10-day long festival. In addition to performing in the final concert on Saturday, July 14 at Disney Hall, Hector participated in composition and songwriting workshops, international music education courses, leadership workshops, cultural significance of music discussions, group lessons, ensemble and orchestra workshops, and chamber ensembles. A bright and motivated viola player who has participated in the Paterson Music Project for four years, Hector, 12, has proven that his growth and ambition show no signs of stopping. In addition to practicing with PMP three times per week, he serves as a Junior Teaching Assistant, assisting and teaching younger students in grades 2-5 on days he does not have class. Hector also participates in Montclair State University John J. Cali School of Music’s prepatory program on Saturdays, an honor which only eight PMP students have received. Says Hector, “I want to be a doctor some day. I see that there are a lot of people that need help across the country and I want to help.” This fall marks Hector’s fifth year in the transformative music program in Paterson where he will continue in the Concert Orchestra and as a teaching assistant. 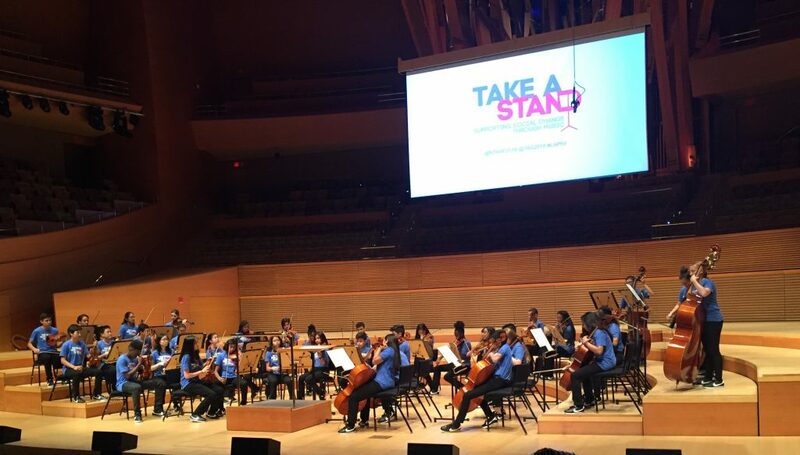 The National Take a Stand Festival is an opportunity for students from El Sistema-inspired and aligned programs throughout the United States to perform as part of a top-tier national youth orchestra. The National Take a Stand Festival is a free program: travel, lodging, meals, and programming are provided at no cost for all participating musicians. By offering young people the opportunity to learn from exceptional musicians, including world-renowned conductors and guest artists, become ambassadors of their programs, and engage with young people from diverse regions and backgrounds, the orchestra aims to develop a model for excellence and a national community of citizen musicians from historically excluded populations in the United States. Students not only have access to top artistic and educational resources, but experience some of the world’s finest learning institutions and concert venues. This year’s festival featured two ensembles: a Symphony Orchestra for advanced musicians aged 12-18 and a Junior String Ensemble for intermediate string musicians, aged 12-15. 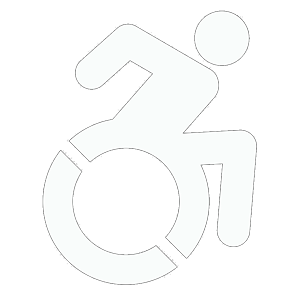 The festival aims to develop a model for excellence and a national community of citizen musicians from historically excluded populations in the United States. Young musicians from diverse regions and backgrounds will become ambassadors of their programs, learning from world-renowned conductors and artist mentors in beautiful settings and concert halls, including Walt Disney Concert Hall.